"Originally a recipe from the 1960's that was meant to be served with drinks for a St. Paddy's day celebration. Personally, I think these are good for any occasion!" Unfold the sheets of puff pastry, and brush tops with egg white. Sprinkle pistachios and salt over the egg white wash; flip the sheets, brush with egg white, and sprinkle with pistachios and salt. With a sharp knife, cut pastry into 3-inch long strips, about 3/4 inch wide. Twist the strips twice, then arrange on the prepared baking sheets so they don't touch. Bake in the preheated oven until browned, about 15 minutes. 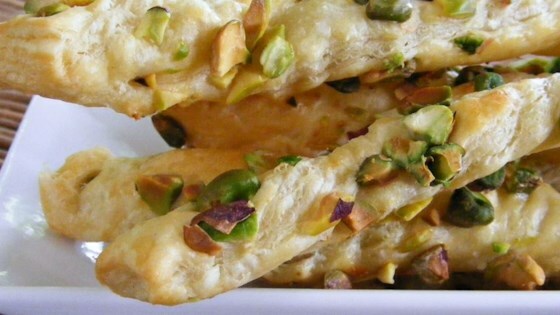 These cheesy Pepperidge Farm® Puff Pastry strips are so easy to make! If you prefer to use piecrust instead of the puffed pastry bake at 425 degrees F (220 degrees C) for about 10 minutes or until lightly browned. I really love this recipe, it is so simple and easy. Sometimes for a slightly sweet touch I melt together some butter and honey, and brush the twists just before I take them out of the oven. So easy and so tasty! What a light, delightful appetizer! I made these as directed, but added a little grated Parmesan as well. A real crowd pleaser!